you can hold your putter in a variety of ways. When it comes to a putting grip, you have many choices. Your hands should sit comfortably on the putter while maintaining a square alignment of the putter head to the target at impact. Remember - what happens at the bottom end of your putter is determined by what happens at the top end of your putter. The most common putting grip is the reverse-overlap. Unlike the grip for the full swing where you wrap the little finger of your right hand over your left index finger, you reverse the process. Here you place your left index finger over the little finger of your right hand (or extend it over all the fingers of your right hand). Both your thumbs are positioned straight down the grip. A variation entails placing the forefinger of the right hand down the shaft of the putter. An important aspect of the grip is where the putter shaft rests in your hands. The putter shaft should lie in the lifelines of your hands up against the fleshy pad and not in your fingers. 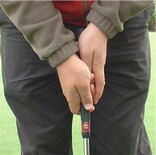 This position reduces any tendency for your wrists to hinge and unhinge during the putting stroke. It also helps to reduce putterface rotation. Some teachers still advocate holding the putter in the fingers of each hand in order to achieve a better feel. This technique tends to promote a wristy rather than a pendulum-like stroke orchestrated by the shoulders. I have read that the trade-off in where you hold the putter shaft is feel versus consistency. I don't subscribe to this view. I believe that to putt well, you have to putt consistently. Placing the shaft in your palms is more likely to give you a consistent stroke as it reduces wrist hinging. A number of professional golfers now use a cross-handed grip with the left hand lower on the shaft than the right. This putting grip is designed to increase left-hand control and prevent any hinging or cupping of the left wrist through the area of contact. The claw (or saw) grip which sees the right hand holding the putter in a similar manner to the grip for the long putter is used for a different purpose. In putting, a common fault is for the right hand to overpower the left hand in the forward stroke and for the putt to be pulled left of the target. To reduce any tendency for the right hand to dominate, the right hand is rested gently on the shaft allowing the left hand to guide the putting stroke. The idea that it is easier to pull a shopping trolley in a straight line than push it. Another importance aspect of your putting grip is the effect it has on the alignment of your shoulders and your forearms. In the traditional grip the right hand is positioned below the left. The effect is to push the right shoulder and forearm ahead of the left shoulder and forearm. This means that the shoulder and forearm flow lines, unless corrected, will be pointing more to the left rather than parallel to your aimline. As your putter path typically follows the line of your shoulders, your putts will be pulled to the left. With the left-hand low grip, the opposite will happen, and putts will be pushed to the right. One technique to prevent your right shoulder moving forward is to tuck your right elbow in towards your right hip. This prevents an over-the-top condition that occurs when your right forearm is further forward from your body than your left forearm. If you stand over a reflective surface and change your putting grip from right-hand low to left-hand low, you will see how your shoulders move forward and backwards. The only time that your shoulders will be in a neutral position is when your hands are placed alongside each other on the grip. This is sometimes referred to as the prayer grip. Whatever your method of holding your putter, you should pay close attention to the correct alignment of your shoulders and forearms after you have placed your hands on your putter.